Carlene Aguilar and husband Yo Ocampo had this horrible experience during their stay in Boracay, which was like a preview of the Mayweather vs Pacquiao fight. Miss World Philippines 2005 Carlene Aguilar and husband Yo Ocampo are currently in Boracay for their #Laboracay getaway, and the incident happened early morning Friday, May 1, Labor Day. According to the former beauty queen's Facebook post yesterday, they were attacked in their room at the Grand Boracay Resort and Hotel by no other than the hotel owners, with her husband getting mobbed, sustaining injuries. Oh no! "Harrowing Experience at GRAND BORACAY Hotel! 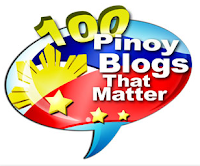 Please read my very own Personal account of the incident & you be the judge! It was around 1-1:50am when I was returning to my room at the 4th floor of the hotel. I was then walking at the corridor, which 3-4 adults side by side can pass, when i noticed a guy walking towards me. I was surprised that when we crossed paths He intentionally bumped me. He smelled intoxicated , obvious ang amoy ng alcohol. I could have let the obvious harassment done to me pass but my husband who was waiting for me near our room's door saw what happened, no sorry was heard from the guy who brags to be the son of the owner. A simple sorry would do sana but my husband educated as he is let the incident pass and we went inside of our room. We were about to sleep na sana then suddenly a very Loud Bang from our door and shouts from several Angry people were heard outside our room. 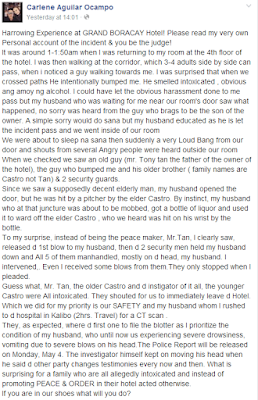 When we checked we saw an old guy (mr. Tony tan the father of the owner of the hotel), the guy who bumped me and his older brother ( family names are Castro not Tan) & 2 security guards. Since we saw a supposedly decent elderly man, my husband opened the door, but he was hit by a pitcher by the elder Castro. By instinct, my husband who at that juncture was about to be mobbed, got a bottle of liquor and used it to ward off the elder Castro , who we heard was hit on his wrist by the bottle. 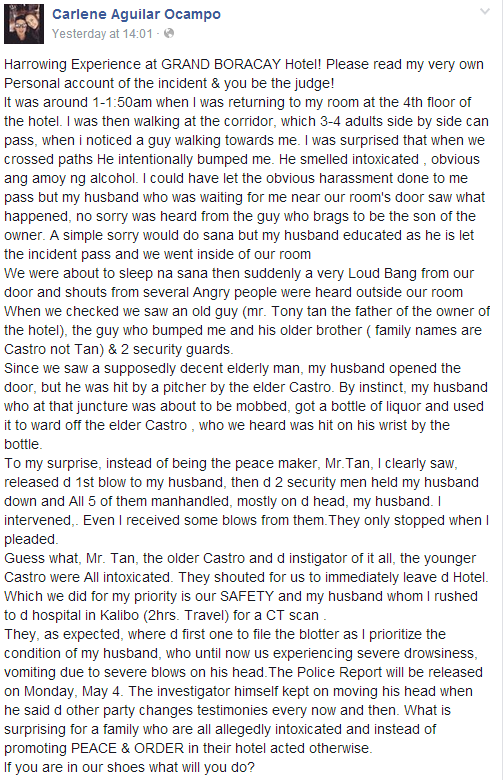 To my surprise, instead of being the peace maker, Mr.Tan, I clearly saw, released d 1st blow to my husband, then d 2 security men held my husband down and All 5 of them manhandled, mostly on d head, my husband. I intervened,. Even I received some blows from them.They only stopped when I pleaded. and my husband whom I rushed to d hospital in Kalibo (2hrs. Travel) for a CT scan . They, as expected, where d first one to file the blotter as I prioritize the condition of my husband, who until now us experiencing severe drowsiness, vomiting due to severe blows on his head.The Police Report will be released on Monday, May 4. The investigator himself kept on moving his head when he said d other party changes testimonies every now and then. What is surprising for a family who are all allegedly intoxicated and instead of promoting PEACE & ORDER in their hotel acted otherwise. If you are in our shoes what will you do?" In her latest Instagram post, Carlene said that her husband is now okay, and she also thanked Boracay Mayor John Yap for the security assistance he gave to them. If there's any truth to her claim, then it's certainly very unacceptable. People who were supposed to take care of their guests were the ones who posed security threat to them.